Without a doubt, the BillyOh Mad Dash 4000 Gingerbread Playhouse Max + Bunk is one of the most eye catching playhouses in the BillyOh line. The Max + Bunk is the biggest of the Gingerbread Playhouse series and features a very cool upper bunk level that the kids can get to via a nifty little child safe ladder. This gives them a little extra storage space or even a little area to have a nap. The playhouse has a lot of charm with four good sized windows that each have a window box. The playhouse more resembles an actual house than a place where kids can have fun! For the price this is a fantastic playhouse. The walls are made with high quality tongue and groove shiplap cladding that as well as looking amazing also will keep the rain from getting in. 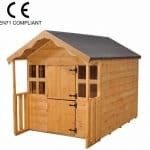 This is supported by a very sturdy frame that allows the playhouse to take all the punishment the kids can throw its way. A high apex roof provides them with all the headroom they could need. 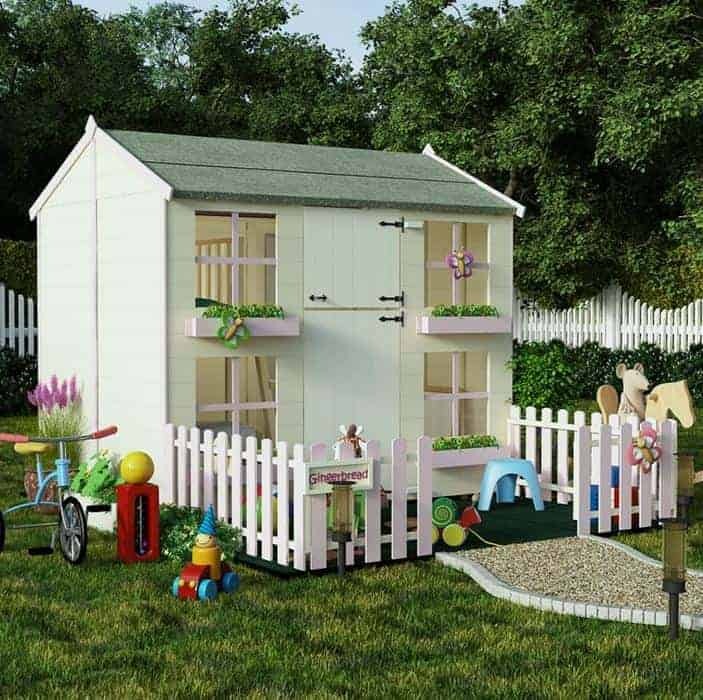 The playhouse looks awesome as it is, but there are a number of great extras such as colours, extra strong floor and even a picket fence that you can add. Looks just like a real house! The BillyOh Mad Dash 4000 Gingerbread Playhouse is a series of playhouses that has three designs. The BillyOh Mad Dash 4000 Gingerbread Playhouse Max + Bunk is the flagship piece of this line and that is the main focus of our review today. But there are also The Gingerbread Max and The Gingerbread Junior that are part of this line as well. Anyway, the BillyOh Mad Dash 4000 Gingerbread Playhouse Max + Bunk is more than just a simple playhouse it is like your child has their own home in your back garden. This looks more like a house than a kids playhouse and we just love the design. It is a very impressive size as it stands from bottom to its highest point at, 6 feet 3 inches. The width is 6 feet 11 inches and the depth 5 feet 7 inches so there is plenty of room inside here for them to play. The main event of this model is that there is a ladder inside which lets them climb up to an upper bunk. This is really fun and something we are sure kids are going to love. This bunk can actually be removed as the kids grow which would greatly extend the amount of years they can use this playhouse. The roof is mineral felt covering solid sheet boarding and at this price range that is exactly what we would expect. 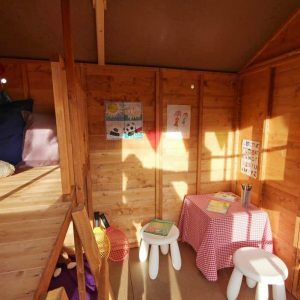 We feel that they have designed the roof the way they have so the playhouse resembles an actual home. 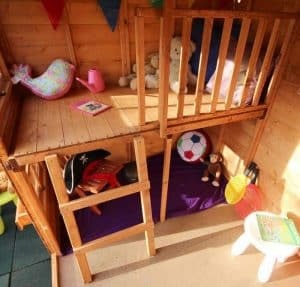 While we like this, we feel that a slight overhang might have benefited this playhouse as the way it is if there is a lot of rain then there is a high chance it could run off the roof and drip down the front of the playhouse. We really like the tongue and groove shiplap cladding that they have used as it is going to keep the inside of the playhouse nice and dry. The cladding has a very smooth look to it and actually you do not even really notice it from the front. You have to go round the side and the back to really appreciate just how much work has gone into this cladding. A 1 X 1 frame is used to keep everything solid and while not the biggest frame we have ever seen, at this price this is the best frame you could possibly get, so we have no complaints about the frame at all. They know that kids can play a little rough, but this frame is solid and strong enough that it can take a bit of abuse from the kids. As standard, the flooring is economy solid sheet flooring which has clearly been chosen to help keep the costs down. We have no issues with this floor and while it may not look the best it is going to do what you want a floor to do. You can pay an extra £57.99 and get a better looking and stronger, tongue and groove flooring which is not just stronger it also is much easier on the eyes. But the kids are probably not going to care, so while we really appreciate the fact they give you this option, it is not essential. As is the case with the other playhouses in the BillyOh range the BillyOh Mad Dash 4000 Gingerbread Playhouse Max + Bunk will require a good coating of wood treatment within a week or two of construction. A new coat once a year is all that you will need to do to keep the playhouse free from rot and decay. 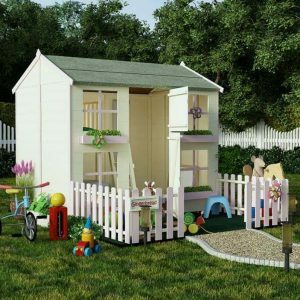 Like the other BillyOh playhouses, you will get a generous five year warranty with this playhouse. The BillyOh range seem to always have some kind of unique and interesting door. This one has a stable style door, but unlike other playhouses with a stable door it is not just a door cut in half. The top section is much smaller than the bottom. What is the point of this? Well honestly we have no idea, but it does look very cool and we are sure the kids will love it. The door is well made and safe for your kids fingers as it has a easy to open and close magnetic catch. Also at 4 feet 9 inches high and 1 foot 11 inches wide, the kids will have no trouble getting even their biggest toys into the playhouse. The front of the playhouse has four good sized windows that are made with styrene. They have a cross design to give them that little bit more charm and each window has a lovely little window box that the kids can put some flowers in or just fill with random items. We really like the windows and they certainly help make this playhouse look more like a home. But if we had to be super picky we do wish that there was a window on each of the sides of the playhouse or at least the option to add them as an extra. Security and playhouses do not really go together because as a parent the last thing you want to do is have to go and unlock the playhouse every time they want to go inside it. So there is no lock on the door, but it does close securely enough so it is just as secure as the other playhouses that are on the market. 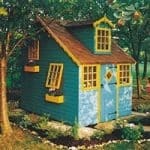 When it comes to privacy it all depends on where you have the playhouse. All the windows are located on one side so if you are worried about neighbours looking in or random people walking past then you could just face it away from where people can see it. The BillyOh Mad Dash 4000 Gingerbread Playhouse Max + Bunk will come to you unpainted, but for £7.99 you can choose between Cream, Black or Slate Grey as a trim colour. They also have a number of choices for the colour of the actual playhouse: Red, Green, Pink and Purple are just a few of the colours that you can choose. Colours cost £12.99, which is not a bad price. We already mentioned how you can add a better looking and stronger floor, but let’s face it, you want to know about that awesome picket fence that is in the pictures. 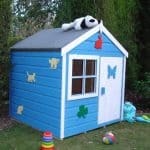 Well this can be added at a cost of £55.99, which is not a bad price and does finish off the playhouses nicely. 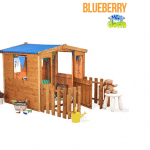 Also, while this is the largest version of the BillyOh Mad Dash 4000 Gingerbread Playhouse range, there is also the BillyOh Mad Dash 4000 Gingerbread Playhouse Max which does not have the bunk, but is the same size and costs £329. 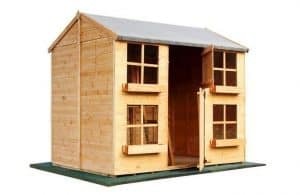 There is also the BillyOh Mad Dash 4000 Gingerbread Junior which is 6 X 4 has no bunk and only two windows and costs a very reasonable £199.99. Even with the economy flooring this is still a very high quality playhouse. Even more so when you consider it is being sold for well under £400. This is made to last and is structurally very strong. But to keep it free from rot, you are going to have to make sure you treat the wood properly. If you get the one with the bunk then as the kids get older you can take it out so they have more floor space and room as they get bigger. Even the max model is not overly huge, so even more compact gardens should be able to fit this in. In theory this should be quite a straightforward job. Just be sure to have a friend to help you out as this is a two person job. Well three if you want there to always be someone on standby who can get the tea and biscuits. 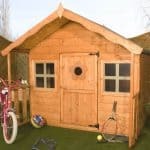 We are very impressed with the price of this playhouse. Even if you added a few of the extras the price is still right in line and actually a bit better than some of the other playhouses we have seen. Final Thoughts: We really like the BillyOh Mad Dash 4000 Gingerbread Playhouse Max + Bunk. It is going to give your kids years and years of enjoyment and it is made well enough that you should not have any problems with them breaking parts of it. Also, as this has such a great look to it, you are not going to mind having this standing in your garden as the design of it really is fantastic. We still have no idea how they are able to sell this at such an affordable price, but we are glad they found a way. 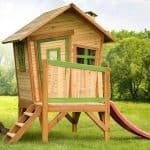 If you want to give your kids a fun playhouse, but also want one that is going to look smart in your garden, then this one here has to make your shortlist.